It is essential that you have read both Part 1 and Part 2 of this series. Also useful is the definition of bid'ah and understanding that it is of two types (haqiqiyyah and idafiyyah) from the angle of how it relates to Shariah evidences (see this article, and this one). We have to understand that there are two orientations as it relates to how bidah is defined and how bidah is defined will affect the nature of any scholars' speech on the subject. As for the first orientation then they use the word bidah (بدعة) to refer to every newly-arising thing which is not found in the Book and the Sunnah, irrespective of whether it relates to worship (ibaadah) or custom (aadah) and regardless of whether it is praiseworthy or blameworthy. This understanding and usage of the term bidah is known from Imam al-Shafi'i and his followers were influenced in this such as al-Izz bin Abd al-Salam, al-Nawawi, Abu Shaamah, and likewise from the Malikis, al-Qarafi and al-Zarqani, and from the Hanafis Ibn Abideen, and from the Hanbalis, Ibn al-Jawzi. The other orientation is the one which states that bidah (بدعة) is applied only to religious matters and thus it can only ever be blameworthy and evil, and in this they are applying the Shariah meaning for the word bidah. Bidah is of two types: praiseworthy and blameworthy. Whatever is in agreemenet with the Sunnah it is praiseworthy and whatever opposes it is blameworthy. The newly-invented matters are of two types: The first of them is that which has been introduced from that which opposes [something from] the book, or [something from] the sunnah, or a narration, or [a matter of] consensus. This is the misguided innovation. And the second is that which has been introduced of goodness and does not oppose any of these things [qur'an, sunnah, athar, ijmaa']. This is the newly-invented matter which is not blameworthy. Bidah is of two types: A bidah that opposes [something from] the book, or [something from] the sunnah, or [a matter of] consensus, or a narration from some of the Companions of Allaah's Messenger (sallallaahu alayhi wasallam), this is the misguided innovation. And a bidah which does not oppose any of these things [qur'an, sunnah, athar, ijmaa']. This is what can be good (hasanah), due to the saying of Umar, "What an excellent innovation this is". For his saying (sallallaahu alayhi wasallam), "Every innovation is misguidance" is from the concise, profound words (jawaami' al-kalim), nothing exits from them, and it is a mighty foundation from the foundations of the religion. 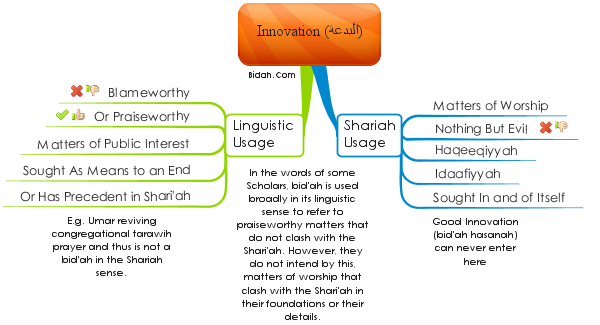 As for whta occurs in the speech of some of the Salaf of considering some of the innovations to be good, then that is in relation to linguistic (usage of) bidah, not the Shariah (usage). From (the examples) of that is the saying of Umar (radiallaahu anhu) regarding the tarawih (prayer), "What an excellent innovation." And bidah is of two types. Sometimes it can be a legislative innovation (bidah shar'iyyah), such as his saying, "Every newly-invented matter is an innovation and every innovation is misguidance" and sometimes it can be a linguistic innovation (bidah lughawiyyah), such as the saying of Amir al-Mu'minin Umar bin al-Khattaab, (radiallaahu anhu) about his bringing them together for the tarawih prayer and their continuance upon that, "What an excellent innovation this is." From what has preceded it should now be very clear that in the usage of some of the Scholars, they employ the word bidah with its linguistic meaning to include praiseworthy matters which either a) already have a specific precedent in the Shariah and are therefore not 'bidah' in the legislative (Shar'iyy) sense or b) matters which pertain to public interest (maslahah mursalah) which do not clash with the Shariah but rather are in agreement with it and its objectives and are considered praiseworthy (such as building schools). This should be kept totally separate and distinct from the censured and condemned bidah in matters of worship which can be innovation from all angles, in every sense of the word (bidah haqiqiyyah) or from some angles only (bidah idafiyyah). Or in other words: Every innovation in the arena of the acts of worship which do not have any basis or foundation in the Book or the Sunnah or from the rightly-guided Caliphs or Companions, in either their foundations, or their details, then it is a blameworthy, repulsive bidah in the Shariah. And al-Shafi'i responded to the saying of the one who said, "There is nothing from the house (ka'bah) that is abandoned" with (the response) that: We have not left touching the (two corners) out of abandoning the house, and how can a person be abandoning it when he is making tawaf around it. Rather, we follow the Sunnah both in performance (fi'l) and abandonment (tark), and if not touching them both constitutes abandoning them, then not touching what is between the corners would also be abandonment of it, yet there is no one expressing this [view]. Al-Shafi'i indicates this is the practice of the Messenger (alayhis salaam) - to only touch the two corners - and Ibn Hajar says (3/474) that to kiss the first (the stone) and touch the second (Yemeni corner) only (and not touch or kiss the other two) is the view of the majority. In reality, what they are upon is the bidah idafiyyah in matters of worship (ibadah) and they attempt to make it appear that what they are upon of reprehensible innovation which has no evidence for its particulars and details from the Sunnah is of the same category as what is entered into a purely linguistic usage of the term 'bidah' by some of the scholars. So their deception is clear walhamdulillaah. We will make their deception even more clear in our series "Proof That The bidah idafiyyah is Evil and Rejected" (read series here). Refer to that for more details which will highlight ever more clearly their departure from the way of al-Shafi'i (and others they claim to be following such as al-Izz bin Abd al-Salam).